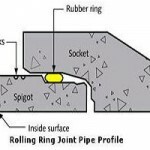 Psc Pipe Rubber Rings - We are a reputed manufacturer of a premium rage of Rubber O Rings, which have been manufactured as per highest ISI 5382 standards. These O Rings are used for PSC Pipes and are available in various standard and customized sizes. The rubber O rings are suitable for reducing the soaring costs and production losses when used in the manufacturing process and prevent any kind of repetitive motion injuries.